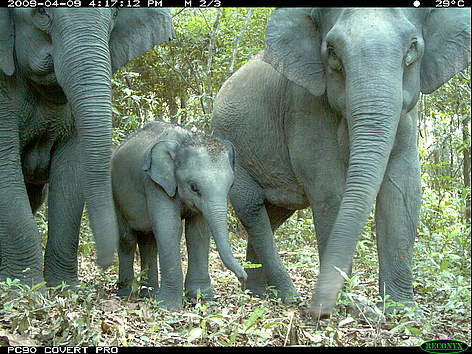 Juvenile and adult Asian elephants photographed by a camera trap in Phnom Prich Wildlife Sanctuary in northeastern Cambodia's Eastern Plains Landscape. In Cambodia, the largest population of Asian elephant probably occurs in the Eastern Plains Landscape of Mondulkiri province. Camera-trap photos and sign surveys indicate a healthy reproducing population However, given the encroachments of human settlement and agriculture into forest areas, human-elephant conflict is likely to become a significant problem in the future. WWF is currently undertaking a large-scale survey that will analyse DNA from elephant-dung to arrive at a clear estimate of elephant population size in the Eastern Plains.